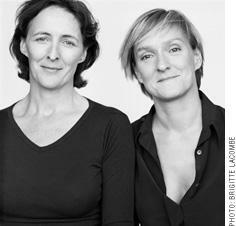 This year marks a 25-year working partnership between Fiona Shaw and Deborah Warner. They first worked together on a landmark production of Electra at the Royal Shakespeare Company in 1988 (Olivier and London Critics’ Awards, Best Actress). Further productions together: The Good Person of Szechuan (National Theatre, Olivier and London Critics’ Awards, Best Actress), Hedda Gabler (Abbey Theatre, Dublin and West End; London Critics’ Award, Best Actress, Laurence Olivier Award for Direction and Production), Footfalls (Garrick Theatre, West End), Richard II (NT, Paris, Salzburg; French Critics Best Foreign Production), The Waste Land, (Brussels, Dublin, Paris, Toronto, Montreal, Cork, London, Adelaide, Perth, Dublin, Bergen, Madrid and New York; Two Drama Desk Awards, Best Director Obie Award); Medea (Abbey Theatre, Dublin, West End, BAM Paris and Broadway; Evening Standard award for Best Actress and Best Director; Tony Award nominations for Best Actress and Best Director and two Obie Awards), The Powerbook (NT), Readings (Paris; A Poetry show), Julius Caesar (Barbican, Paris, Madrid and Luxembourg); Happy Days (NT, Epidauraus, where it made history as the first 20th century text to be performed in the ancient theatre, Amsterdam, Paris, Dublin, BAM). Dido and Aeneas (Vienna, Opera Comique – Paris, Amsterdam) Mother Courage and Her Children (NT) and Peace Camp for the London 2012 Cultural Olympics.